A field trip to the zoo is the best way to get out of the house this summer! Enjoy an animal adventure by capturing zoo life including monkeys, penguins, lions, zebras and more. Take a break at the snack stand with some delicious popcorn and hop on the zoo train ... watch out for the snakes! 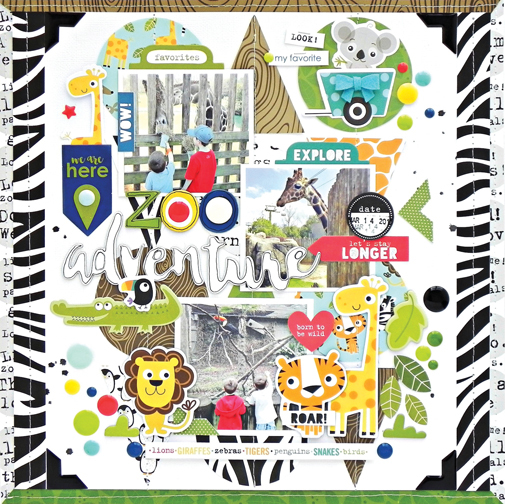 Enjoy The Zoo Crew from Bella Blvd, including six double-sided patterned papers, two embellishment papers, coordinating cardstock stickers, chipboard stickers, Paper Pieces die-cuts and new washi tapes too!